I spent this afternoon at the annual general meeting of the Limerick Protestant Orphan and Childcare Society. Today, this is very much a 21st century charity that has revised its statutes to meet the real demands and needs in the diocese and society. But the former Protestant Orphan Society Hall at the north end of Pery Street is a solid reminder of the Victorian origins of this society and its 19th century benefactors. The hall is close to some of the Limerick’s finest churches and bank, standing between Saint Michael’s Church of Ireland parish church and Saint Saviour’s Dominican church, and close to Baker Place and the People’s Park. It is one of the finest and most elegant buildings in this part of the city. It was built in 1856 to designs by the Limerick-based architect William Fogerty (1833-1878). It was designed by Fogerty and built in limestone as a six-bay two-storey over basement hall in a Jacobean style, with a square-plan projecting tower to the north. William Fogerty was born in 1833, the second son of the Limerick architect John Fogerty and a younger brother of the architect Joseph Fogerty. He was a student at Queen’s College, Cork, in 1850-1851, and began practice as an architect in Limerick with his father in the 1850s. In 1855-1856, Fogerty built the Protestant Orphan Society Hall as a new collegiate Gothic Hall in an exuberant Jacobean Revival style. 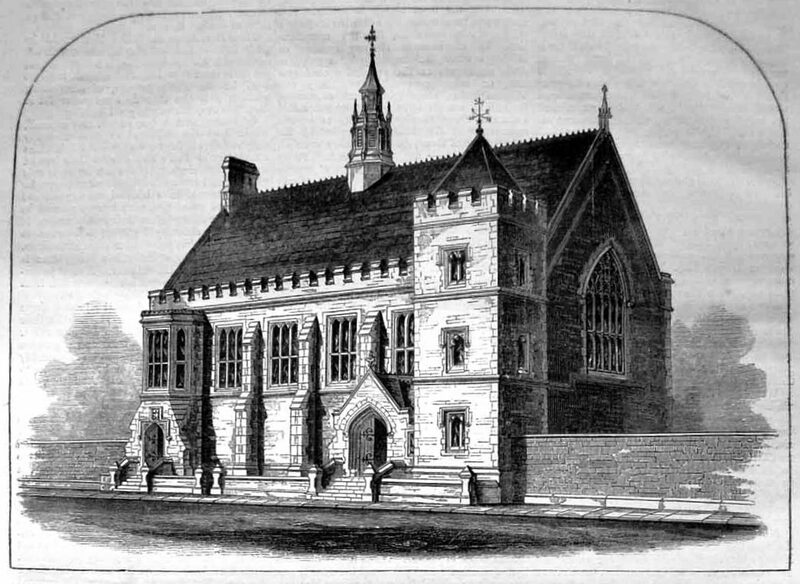 His other buildings in Limerick included the Episcopal Church or Holy Trinity Church (1858-1859) on Catherine Street, and the District Lunatic Asylum (1863) on Mulgrave Street, which included a Gothic chapel and Turkish baths. Fogerty continued to work from 97 George’s Street, Limerick, until 1864, when he moved to Dublin. There he practised from 23 Harcourt Street, and he was elected a Fellow of the Royal Institute of Architects of Ireland (FRIAI) that year. After making a tour of Italy in the autumn of 1869 with Thomas Henry Longfield, he moved around 1870 to London, where his brother Joseph was practising as an architect. His son, John Frederick Fogerty, also became an architect. When the Protestant Orphan Society Hall was built, the surrounding area abounded in charitable foundations, including the Protestant Female Orphans’ Home, the Lansdowne Soldiers’ Home and the Asylum for Blind Females. Although the interior of the hall appears to have been lost, as well as the original windows, when the building was converted into offices, and the original windows have been replaced with ugly uPVC versions. But this building remains an important landmark building in the heart of Limerick.